Stayed in a very comfortable hotel called Eken in Bandirma, a quite modern town that has a ferry to Istanbul, and has quite a lot of through traffic to and from mainland Turkey. I was there as I needed a new back tyre and had seen various recommendations for Bora Eris's establishment on Horizons Unlimited. We had been in contact and he was able to find the right tyre. I was surprised that the size was not very common in these parts, so it was a bit of a struggle. 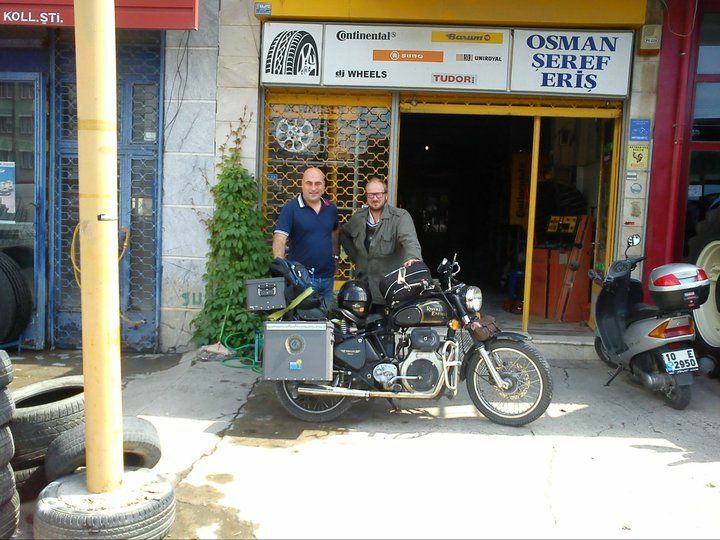 The old tyre had done a bit under 6000 miles, so it was a bit of a disappointment, thinking I would get to India on the set I had. In retrospect, I should have upgraded when commissioning Batty. Bora was most helpful and arranged for the tyre to be fitted and his colleague set about cleaning Batty, without any prompting and did a great job. I had said I wanted to clean her up a bit, for no other reason than to monitor a seeming oil leak from the rocker box cover. The nuts were a bit loose, and I hoped that was all it was, and it was. It was a great and enjoyable service. Left at about lunchtime to make for Pamukkale further south. I knew something was amiss with the centre stand on the bike for sometime, as it had stopped supporting the bike and was dropping down. I got fed up with it and took it off, a very oily roadside job and having had pretty clean hands for a number of days, I was back to blackened finger nails. Alas Swarfega and nail brushes are not easily found items here. I have noticed a brilliant concept in Shanghai, as well as in Cambodia, of this simple count down of seconds on the traffic light before they change, and I noticed it here as well. Such a simple way, of keeping everyone calm, and then getting everyone prepared to move off etc. It is such a benefit to drivers, I wish they would start introducing it it back in the UK. Staying in a lesser establishment in Akhisar, although perfectly functional and clean-ish, it is tired to say the least, but it is half the price of last nights at £10, and fine for my light needs. It is very central and have felt very close to the gentle hustle and bustle of the place. Trying to explain the need for a nailbrush to shop keepers has been an amusing challenge and impossible so far.